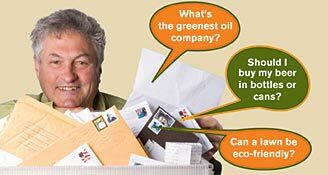 BOB SCHILDGEN (aka Mr. Green) was managing editor and book review editor of Sierra magazine for many years, and continues to write Sierra's popular "Hey Mr. Green" environmental advice column. A native of rural Wisconsin, where he grew up on a farm, Schildgen now resides in Berkeley, California, where he indulges his passions for gardening and thrift by growing two dozen types of vegetables in his backyard. Got a question for Mr. Green? Submit your question. Fear not, Sierra magazine's answer guy is still dishing out advice. Visit the Green Life blog to read new posts from the inestimable Mr. Green. How Can I Make Great Gas Mileage Even Better? My 2007 Ford Focus has given me 44 mpg on highway trips, but I want to improve its mileage even more. Is it more fuel efficient to coast down hills and ride the brakes when necessary, resulting in higher brake wear, or shifting to a lower gear and using engine breaking to control my speed? —Pokey-but-saving-fuel, in Minnesota. You won’t save fuel by shifting to a lower gear to brake the car, according to automotive engineers I’ve interrogated. You might even use more fuel because engines have to turn faster to maintain speed when they’re in lower gears. You’re better off just relying on the brakes, unless of course the hill is extremely steep, and the brakes are failing to slow you down enough, and you actually need engine braking to save your thrifty hide. But instead of “riding” the brake, please try pushing it intermittently instead keeping your foot on it constantly. Do not—I repeat, do not ever simply turn off the engine and coast in neutral to conserve fuel, because it’s way dangerous, thanks to certain issues, like your power brakes won't function. Even for the most dedicated hypermiler, to lose one’s life to save gasoline is too great a sacrifice. Okay. Now you’re wondering about the EPA rating, because, while you’re widely exceeding it, a lot of drivers out there in Gridlockia whine that they're falling far below the EPA mileage rating. Well, one reason a sensible driver can beat official rating is because the EPA bases its assessment partly on the very plausible assumption that many people drive without much concern for saving fuel: They speed, make jackrabbit starts and slam-the-brake stops, and run the air conditioner when they don’t need it. Add to these follies pointless idling, surplus cargo, lousy maintenance, low tire pressure, unnecessary four-wheel-drive engagement, failure to use cruise control or to shift into overdrive on the highway, and idiotic tailgating that requires incessant braking, and, of course they fall short of the EPA rating. For some useful tips on “hypermiling,” see CleanMPG.com. To find a whole lot of information on car efficiency, go to the EPA site fueleconomy.gov. Your tax dollars at work, unless the anti-environmentalist right-wingers in Congress defund the EPA to the point where such services are scratched. There’s no great harm in purchasing such discount items, though the fact that they are often heavily processed, refined, and suffused with additives might be reason enough to avoid them anyway. In the long run, you might save more money by purchasing foods that are simpler, more wholesome, and minimally packaged. For some useful advice on Better Eating Through Simplicity, see my “10 Ways to Eat Well” in Sierra. Of course not all food packaging is bad, for the obvious reason that it preserves literally millions of tons of food that would have gone bad and gotten dumped. The real problem with food packaging is too little is recycled, too much of it is not recyclable, and there is a wretched excess of it. For example, we’re still only recycling about 30 percent of plastic beverage bottles, while many types containers are either made of non-recyclable material or contain such a jumble of if that they can’t be economically recycled. And tro we really need all those teeny-weeny one-serving bags and boxes marketed in the name of America’s patron saint, Convenience? Packaging as a whole accounts for about 30 percent of our 243 million tons of municipal waste, to which food packaging contributes about half, according to the Institute of Food Technologists. But it’s not just the food packaging. Our waste stream has swelled steadily over the years, from 2.66 pounds per person in 1960 to 4.34 pounds today, of which 1.46 gets recycled, retrieved, or composted. If our quality of life had improved correspondingly there might be some justification for this proliferation of rubbish, but it’s hard to see any serious improvement in that department. The fact that we operate twice as many garbage trucks as city buses is an indicator of this folly. The fact that generating this prodigious waste adds to the Gross Domestic Product is a cold comfort indeed. I keep wondering if we’ll ever figure out environmentally gentler ways to beef up the GDP than to pile up more refuse or create more and bigger jails, casinos, gas guzzlers, trophy homes, bombers, malls, coal mines, parking lots, hog-manure lagoons, and tar-sand-oil-extraction ruins. Maybe the economic geniuses who dreamed up those theories to justify the hedge funds and derivatives that wrecked the economy can repent by turning their attention to some alternative paths to prosperity. How Do Fluorescent Lights and LEDs Compare? Your comparison showing energy use of incandescent bulbs to fluorescent bulbs was interesting. So how do LED bulbs compare to fluorescents? —Jeff, in Southhampton, U.K. Comparing the EPA’s Energy Star ratings for the two types of bulbs, you find fluorescents are somewhat more efficient LEDs, requiring about two-thirds as much energy for the same intensity of light. Fluorescents have a light output of 65 to 75 lumens per watt, compared to LEDs’ 45 to 55 lumens per watt. But of course LEDs are still way more efficient than incandescents, using only about a third as much energy for the same level of illumination. An advantage for LEDs is their longer life span, most being rated for 25,000 hours of service, compared to 10,000 hours for most fluorescents, and the fact that they do not contain mercury. You can do your own comparisons of hundreds of lights by consulting the Energy Star ratings for fluorescent lamps and the Energy Star ratings of LED lamps. Note that these ratings are for Energy Star-qualified models, not types that fail to meet EPA standards. Price remains a barrier for LEDs, as is often the case for a new technology before economies of scale can be achieved and research and development costs are defrayed. Remember when fluorescent lights cost far more than today? The cost problem might be eased if you can find rebates available from power companies and manufacturers, or tax incentives from the government. For information, go to the U.S. Department of Energy’s Database of State Incentives for Renewables & Efficiency, or to the EPA’s Energy Star listings for incentives. NOTE: These sources are worth consulting not just for lighting, but to find out about possible savings on alternative energy and numerous electrical appliances and devices designed to conserve energy. Good as Gold, or Just Bad Gold? What's the Deal with Jewelry? Well, yes, recycled gold is a good choice, as it requires little processing compared to mining and refining gold, which can cause massive environmental damage by polluting water, using toxic chemicals, releasing toxic heavy metals, and ripping up large areas of land where open pit mining is done. Producing a single gold ring generates an average of 20 tons of mine waste, while the typical large gold mine uses 1,900 tons of cyanide per year to leach the gold out of the ore, according to Earthworks, which monitors mining around the world. There is at the present time no third-party certification of all aspects of the gold-extraction processes, like there is, say, for organic foods, sustainable forestry, and some other industries. Earthworks, however, has contacted scores of jewelry dealers, inviting them to sign onto the “Golden Rules,” which demand a commitment to sound environmental and labor practices. Companies that subscribe are required to report on their sources, and from this information Earthworks has developed a Scorecard to rate jewelry retailers. Brilliant Earth has already received an “A” rating. Blue Nile has agreed to abide by the Golden Rules, but has not yet been rated. A number of larger retailers have earned big fat “F” for refusing to sign the agreement, while others have gotten an “I” for not responding. While this rating system may not be perfect, since it involves self-reporting, it is quite likely that a company flat-out refusimg to sign is burying its dirty secrets as deep as the bottom of a zillion-ton leach heap. But what about the respected principle of “reuse” in the old triad of “Reduce, reuse, and recycle”? Some authorities I’ve consulted say that a used ring can be every bit as romantic as a brand-new model, so you might consider that option, especially if your lover appreciates older artifacts (and she might as well get accustomed to old things anyway, because if the marriage endures, you will be one of them). But I must confess to having very little authority in this aspect of relationships, as I practiced “reduce,” not giving my wife a wedding ring until after we were married. By a strange twist of fate, our landlord ran a jewelry store, and somehow convinced me that a ring was absolutely essential for a successful marriage, upon which I purchased his cheapest model. It seems to have worked well enough, but then diamonds are not forever, and with gold up to $1,800 an ounce, she may consider selling it. I wish you a very happy marriage, and before bidding you adieu, am compelled to expand from environmental to romantic advice, and share my formula for lasting marriage that will be more effective than any rings or ceremonies or couples counselors. The harsh fact is that commingled finances lead to those bitter fiscal disputes that have ruined more relationships than all other problems combined. Therefore, I strongly recommend separate checkbooks, separate bank accounts, and separate credit cards. What's it Cost to Run Those TVs in My Gym? It’s really simple. Just look at your monthly bill, and find the price per kilowatt hour. Then look at the wattage rate of any device, multiply this by the hours you use it per month, and divide by 1,000 to get the kWh. Multiply this by the price per kilowatt hour to see how much it costs to operate. If you have kids, let them do the calculations for wholesome family fun. Maybe they’ll even learn to turn off all their lights and electronic toys. Finally, let us connect these burning environmental issues with larger moral and philosophical question. Why, I ask, why, why do people sweating away to be lean and fit gape at the same screen that entrances millions of flabby, junk-food-engorged couch potatoes? What about brain fitness? Are we incapable of having thoughts of our own while bouncing on a cardio machine? Why, indeed, all these damned ubiquitous energy-wasting idiotizing screens in bars and airports and even motor vehicles? What’s next? TVs in psychiatrists’ offices and priests’ confessionals because we’ve reached the point where we can’t even recognize our hang-ups and sins unless they’re on a screen? I say let’s unplug all these public oblivion devices and save energy while giving captive audiences the opportunity to reactive their minds. Chinese Products and the Environment: Buy or Boycott? Your question really boils down to “Should I buy stuff from China?” But before going there, let’s watch our language: Unfortunately, terms like “eco-friendly,” “green,” and “sustainable,” are about as vague as “religious,” which can describe anybody from a doctrine-spouting hypocrite to an altruistic saint, from a televangelist groping a teenager in a cheap motel to a prayerful nurse giving a life-saving medicine to a kid in a makeshift shelter. Lots of companies talk a green line but don’t walk it. They might crow about their virtuous use of recycled material while remaining mute about the poison they wring out of the stuff into a watershed. Or they’ll televise the clean energy sources that propel their invisible dirty machines in impoverished countries. Hence arose the term “greenwashing” to describe painting a green camouflage on a dirty-gray product in order to attract environmentalists. This is not to say that there aren’t companies making a sincere attempt to be green on many levels, but they are, I fear, greatly outnumbered. Back to “Should I buy stuff from China?” My answer is “Yes,” for the simple reason that not buying from China will have absolutely no effect on its manufacturing and environmental policies. If you want to make an impact, try this: when you do buy a Chinese product, write to the retailer or importer and ask about the environmental practices of the manufacturer. Trust me, this will take less time than many people already waste scrolling through those idiotic product reviews on the Internet, or comparison shopping at Web sites and malls. Granted, an individual boycott of China might give you a sense of moral purity, but the refusal to buy a Chinese-made hoodie or sleeping bag will have zero effect in China. Let’s face it: the place is a major manufacturer, and will remain so for the foreseeable future. What can change, however, is the way China manufactures. But that change will only arrive through engagement with the Chinese and through international demands for clean manufacturing, along with the willingess to extend technical and legal help to China—and all developing countries—to protect people and the natural world. How could it be otherwise? After all, it was only 40 years ago, with the boom of the environmental movement, that we ourselves in the high-and-mighty United States launched an unprecedented effort to clean up pollution, and our battles here are far from over. So it would be crazy to expect China to be anywhere near our level of environmental safety. But because of their rising environmental consciousness and stricter policies they have been making serious progress. I can personally testify to that progress, because 20 years ago I happened to edit a book, China on the Edge: The Crisis of Ecology and Development http://www.chinabooks.com.au/ChinaBooks/search.cfm by Chinese philosopher He Bochuan. An apocalyptic account of China’s environmental catastrophe that was very critical of the government, it sold over 400,000 copies before being in 1989. The situation has changed considerably since then. Many organizations, including the EPA are involved, as can be seen from the EPA’s report on China at http://www.epa.gov/ogc/china/initiative_home.htm These efforts are urgent, because China has such a long way to go. Lead and mercury alone remain colossal there, as starkly reported by groups like Human Rights Watch http://www.hrw.org/home and the whistleblower OKInternational http://www.okinternational.org/. Although China has written strict new laws on lead pollution, many officials ignore them, and worse yet, some local politicos even refuse to allow people to be tested, or they cover up the results if they are. As HRW puts it, “Enforcement has been uneven, and little has been done to reduce lead levels in villages that are already heavily contaminated.” The result is that many people have lead levels 7 times as high as allowed by Chinese law—and that law is already considerably weaker than our own. It’s the same deal with that other notorious heavy metal, mercury. Because of its dependence on coal, which emits mercury when burned, and its outmoded or environmentally sloppy industries, China emits 700 to 800 tons of mercury per year—5 times as much as North America, although its gross domestic product is only two-thirds that of Canada and the United States. But this mess will not vanish because a Made in China label gives us the willies. It will change through the kind of engagement described above, and, of course, it will help if we set a good example. People propagating such claims should be plopped down in the woods to do a tree census, barefoot, sans GPS or ATV. Today, the total forest cover in the United States is only about 70 percent of what it was before European colonization: 746 million acres, down from 1.04 billion, according to the U.S. Forest Service. Species such as the American elm and chestnut have been decimated by imported diseases. In any case, simple numbers are somewhat irrelevant because what matters most is the quality of forest. Some of what are called "forests" are just timber plantations bereft of biological diversity or second-growth groves whose habitats are diminished or open to intense logging practices. Also, many forested lands are now fragmented, which reduces accessible woodland habitats, making it harder for wildlife to thrive. To remain healthy, forests need to be buffered by protected or undeveloped land. To learn more, or to get involved, read the Sierra Club report America's Great Outdoors at http://bit.ly/sc_ago. One bit of good news: Forest cover has declined by only 1.5 percent in the past century, thanks to government rules, improved stewardship, and the reversion of marginal farmland to forest. We have also greatly expanded our forest reserves in parks and wilderness areas. But here's the bottom line: A whopping 93 percent of U.S. forestland isn't permanently protected by federal law. It all depends on how--and how far--the bamboo or wood is transported. Ocean vessels emit less than a sixth of the carbon dioxide that big rigs do while moving one ton of stuff the same distance. So it's possible that bamboo shipped in from, say, China could have a smaller footprint than domestically grown wood trucked 1,000 miles, or brought 2,000 miles by rail. But there are other issues with bamboo: Some operators hack it down prematurely, which can damage the bamboo stand. Also, foreign factories with lax safety standards often use glue containing toxic formaldehyde to bind it. This endangers workers and may pollute indoor air. To get low- or no-formaldehyde bamboo and to support clean manufacturers, check for a "Floorscore" or the Scientific Certification System label; scscertified.com/products lists SCS brands. If an item isn't certified, ask the dealer about factory and harvest practices. Among bamboo's great virtues are, yes, its rapid growth, but also the healthy wildlife habitat it provides, and the fact that it inhales carbon dioxide faster than trees do. Some bamboo aficionados get carried away with simplistic claims about its moral superiority, but in fact, a fair amount of traditional wood is now being harvested and processed sustainably and can be a safe option. Go to the Forest Stewardship Council's Web site (fscus.org) to find retailers that carry cleaner lumber.